Since its inception, the Lock 'n Load Tactical series has been defined by two things: its innovative rule set and its engaging scenarios. We want to put the power to create scenarios and engagements into the players hands, allowing you to get the most out of your game as you go from scenarios we built to charting your own course. This generator is based in a point system defined by the size of the battle you want to play and then modified up or down by the variables of the battle. This means that you get to the action fast. 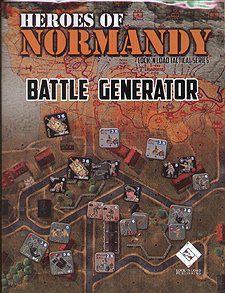 You must own the Heroes of Normandy game to use this Generator System.